Grim fantasy combined with thunderous naval combat in a vibrant, monster-saturated world! Captain an Orc, Dwarf or Human warship and sail the turbulent Abyssal Ocean to play online multiplayer, in free-for-all or squad based matches. Maelstrom is a third-person strategy game created by veteran developers from the Warhammer: Dawn of War series, Company of Heroes, League of Legends, and Overwatch. The goal is to: Loot as much gold as possible while outwitting and outgunning all others and be the last ship sailing. Be ruthless! Sink other players ships, take their loot and collect their bounty! Be greedy! Maps are littered with floating treasure chests and ships loaded with gold. Be cunning! As the match progresses hungry sea monsters become more aggressive and encroach the safe waters ships can sail in. Ships sailing in 'Dead Waters' for too long end up as monster chow! Be unsinkable! 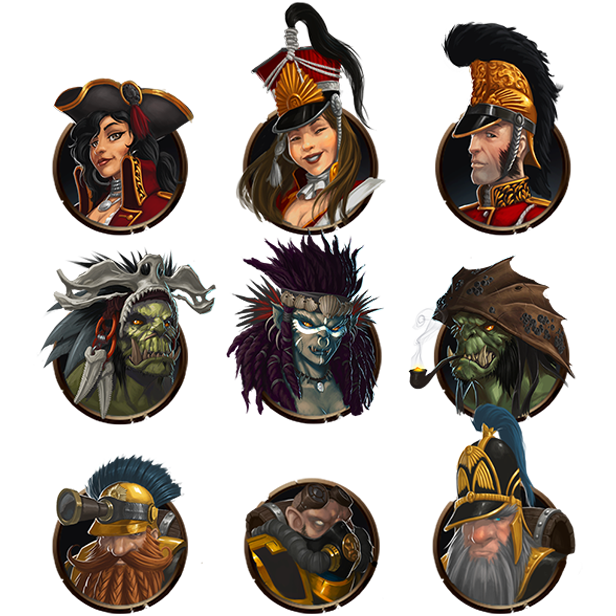 At the end of a match ships can be upgraded and customized with captains, cannons, armor, mates and more! Cannons are the heart of combat in Maelstrom. Cannonballs are physics controlled, with a significant firing arc and hang time, meaning prediction and good aim are necessary to deal damage effectively. On the receiving end, players with good reactions and anticipation coupled with a nimble ship can dodge incoming fire. Ships can be rammed, grappled and boarded! Skillfully sail through the swelling sea and prepare your ship for ramming. The faster the ship is sailing the more devastating the collision! Looking for a deck clearing brawl? Boarding hooks hold both ships in place while crews fight it out. The grapples will be cut eventually, so boarding actions only last a short time. If one crew manages to kill all of the opposing crew, they will set fire to the enemy ship, sending it to the depths! Each ship has armor on all four sides. The armor sections serve as additional defense toward damage to that side and must be destroyed before the ship's hull can be damaged. Maneuvering to keep armor between you and your enemy is vital to staying afloat - and seeking the enemy's damaged sides will make you much more lethal in combat! Every cannon has access to three kinds of ammunition and can swap during combat to suit the situation. Ammo is unlimited! Iron shot blasts chunks out of ship armor and hull. Chain shot is used to shred enemy sails and cripple a ships speed. Grapeshot slaughters enemy crew and makes ships easier to board. Like the ocean they reside in, sea monsters are titanic forces of nature. They stalk unwary captains and can devour a ship whole. Like this Murkwater Thrasher. Each ship in Maelstrom is a character with a colorful history and unique weaponry as well as strengths and weaknesses such as speed, firepower, crew, and toughness. There are many unique ships available for players to unlock and explore. Ashborne has incredibly punishing broadsides and wields spell-infused incendiary ammo, unique to her, which ignites enemy ships! The well designed ships of mankind's Phoenix Empire are the fastest afloat. Each ship is armed with a large number of the most modern cannons available, giving them unmatched range and broadside firepower. The orcs' shark-driven ships are incredibly maneuverable, and have a large number of forward-facing cannons making them deadly on the pursuit. The orcs themselves are ferocious fighters, unmatched in combat during boarding actions. Dwarves disdain brittle wood and flimsy sail, instead forging steel armored steamships. Dwarven ships can withstand far more punishment than the ships of other races and are armed with massive giant cannons on all sides. Though not the most nimble, all Dwarf ships can switch gears and sail in reverse. We promise to get Maelstrom into your hands in a fully playable and fun state and to keep the game healthy; To provide transparency and insight into decisions made about Maelstrom at all levels both vast and granular. To listen and react to what the playerbase likes and doesn't. And most importantly, to honor the faith and trust you've placed in us by purchasing the game. Sink ya soon! Into the Maelstrom! We are live! For this Early Access release we already have nine unique ships to choose from, each with strengths, weaknesses and a special passive ability, captains from all three races with powerful signature moves, and loads of crew members offering subtle bonuses. The battlegrounds are two large maps with a range of features from fog banks, currents and monsters to the titular maelstroms! Fight to win gold and prestige, upgrade and customize your ship, and draw in new crew and captains as your infamy grows! You can read more about our plans for development through Early Access on our roadmap. We also have exciting plans to pick up where our Kickstarter left off with some player number stretch goals, which you can read about here. The world is yours for the taking… if you can avoid ending up as fish food! The biggest indie gaming stories for the week of April 20 2018.